investigation related to the April 5 accident. out of respect for their privacy will keep them confidential." were also believed to be a factor. mining machines once dangerous concentrations are reached. in an interview that he would focus on that question. committed by one or two miners. that "there's no issue about any methane monitoring that I'm aware of"
and say what thousands of people are doing every day," he said. methane monitors and ventilation curtains, were disabled at times. had to do these things, or else you didn't have a job," he said. think it's important to hear what the facts are." 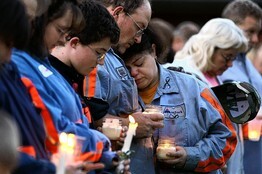 the 1991 death of two miners at a West Virginia mine. paid $2.5 million in the criminal case and $1.7 million in a civil case. to the Mine Safety and Health Administration.